It has been a couple of years since I have seen a new 1/72 sheet from Empire City Decals and the wait has been well worth it. This particular sheet covers a number of aircraft that fought over China during WWII, so that means Chinese, Japanese and Soviet fighters. These are all from the 1938-39 time period, which is really when things were interesting. These are water-slide decals printed by AviPrint in the Czech Republic. They are thin and superbly printed. In fact, there is very little carrier visible outside the actual decal itself in most cases. There are enough insignia and unique markings to do all of the options, which is really nice. 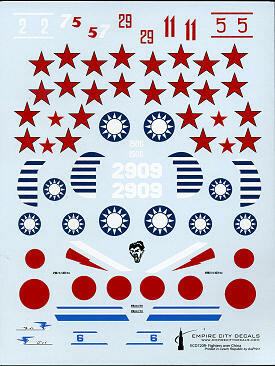 This sheet is also available in 1/48 scale for those who'd rather work on something a tad larger. 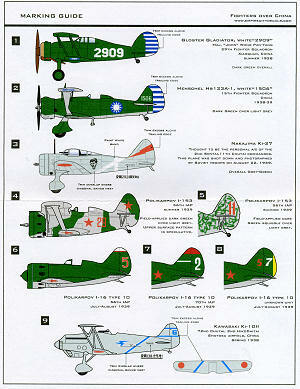 There are two of them on this sheet, with the first being an overall Dark Green Gladiator I as flown by Maj. Wong Pan-Yang in 1938. Next is an Hs-123A from the 16th Fighter Squadron in 1938-39. This aircraft is Dark Green over Light Grey. For the Japanese, there are two planes, both in overall Grey-Green. First is a Ki-27 of the 2nd Sentai, 11 Chutai commander in 1939. The other is a Ki-10 when based with the 72nd Chutai, 2nd HikoDaitai in early 1938. The rest are Soviet from the Nomohan Incident of July-August 1939. Two are I-153s from the 56th IAP. Both are light grey with dark green patches or scribble applied over it. The next three are I-16 Type 10s from the 56th, 70th and an unknown IAP. All are dark green over light grey. A really great sheet with a ton of interesting subjects. Kits are readily available for all these aircraft, though you'll have to some hunting for the Fine Molds Ki-10. Instructions are easy to follow and are printed on cardstock for durability.